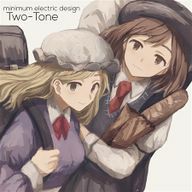 Two-Tone is a doujin album by minimum electric design released on 2016-05-08 (Reitaisai 13). It features vocal and instrumental arrangements of themes from Subterranean Animism, Ten Desires, Retrospective 53 minutes, Magical Astronomy and Neo-traditionalism of Japan. The album features a distinct Alternative Rock tone not previously explored by the circle in addition to featuring far fewer Jazz arrangements than previous releases, it also features the 2 tracks previously released on the mini-album the border. Track 02 "グーテンベルクの科学世紀" was uploaded by the circle to Youtube and can be viewed here. This page was last edited on 28 September 2016, at 13:34.